Specific demands of the plant : Plants for a sheltered, shaded place, between or near trees or shrubs, with a cool soil and maybe an hour or so sun a day. Not too sunny, for instance in a darker corner of a border. This Eastern native perennial is adaptable to a wide range of climates. It forms a mound of lacy blue-green foliage, bearing taller stems of white flowers in late spring. 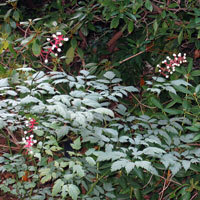 Showy white berries in summer are held on contrasting red stems. A good choice for shade, but requires even soil moisture. The bright green spring foliage and new growth is beautifully bronzed. Flower stems rise above the 24” tall foliage holding small greenish buds opening to bottlebrush white flowers. 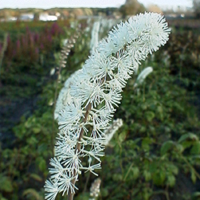 ‘Cordifolia’ blooms after americana and before our other Actaea varieties. 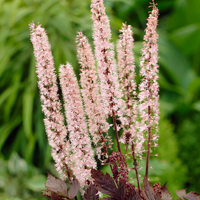 A beautiful plant to plant to get behind in the shade border between trees and shrubs. 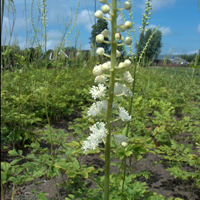 Is 200cm high, with green, pinnately compound leaves and long, white flowers. After flowering the berries, which do appear toxic. 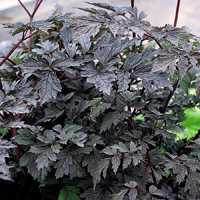 Especially the kind with dark leaves are decorative. The plant has no support. 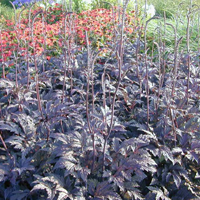 Very decorative plants that do well in the shade or half shade. Use as specimen or in groups. It is a plant that you must have some patience for he only comes to its full development after a few years. 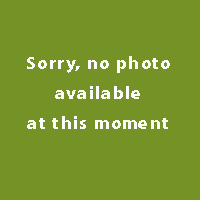 This plant is highly suitable for gardens with several (almost) mature trees and shrubs. Calls for a spot in partial shade and a humus rich soil with little tree roots in her proximity. Put her half in the shade of trees or shrubs, but not too close to it. This plant can also be used as a border plant (on a slightly sunnier place). The bottom should be fine then are damp. Proliferates hardly and can combine well with other plants.